Announcement Welcome to SOFTTOTOUCH. Please browse through my shop to view the many handmade creations I have listed. There are fashion accessories and accessories for the home and office. Why buy department store scarves, cowls, fingerless gloves, etc. when you can own a "one of a kind" fashion accessory from SOFTTOTOUCH? Treat yourself or treat that special someone with an accessory from my shop. And remember, I am happy to do custom orders. I am adding many new items this year...new designs, new colors, with new and different types of yarn. Happy Shopping! Welcome to SOFTTOTOUCH. Please browse through my shop to view the many handmade creations I have listed. There are fashion accessories and accessories for the home and office. Why buy department store scarves, cowls, fingerless gloves, etc. when you can own a "one of a kind" fashion accessory from SOFTTOTOUCH? Treat yourself or treat that special someone with an accessory from my shop. And remember, I am happy to do custom orders. Sequined cowl scarf...Holiday gift idea! I design and create handmade crocheted fashion accessories for women, men and teens, baby items, and accessories for home and office. SOFTTOTOUCH opened in 2013 after many years of dedication and passion for all things crocheted. My name is Cynth and I have been crocheting for most of my life. Each room in my childhood home was adorned with hand crocheted doilies made by my aunts. I first picked up a crochet hook when I was expecting my first child. I started out with baby blankets and baby outfits, but as the years progressed I was crocheting afghans for family and friends. 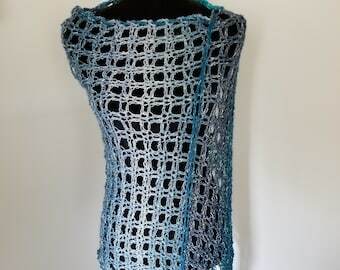 A few years back I started crocheting scarves and now I am proud to offer a wide variety of products, each lovingly and skillfully crocheted offering you high quality accessories. I am pleased to announce SOFTTOTOUCH, in association with The Artisan Group, participated in an invitation-only luxury celebrity gift lounge hosted by GBK Productions on January 8-9, 2016 at an exclusive location in Hollywood, California in honor of the Golden Globe nominees and presenters. A medium sized spa loofah was included to select press and media outlets attending the event. Thank you so much for stopping by my shop and please stop back again as I am always adding new items to my shop.